Springtime for me means that it’s time for ripe tomatoes, fresh herbs, grilling and dining alfresco. We’ve had warm, sunny days but chilly nights for weeks now. Nice enough to grill some nights, but too cool to eat on the deck. This past weekend, I took a chance and planted my herb garden. And last night, we dined al fresco for the first time this season. This recipe for bone-in grilled chicken uses a yogurt-based marinade to both flavor and tenderize the chicken. Lots of do-ahead options: put the chicken on to marinate in the morning or at any point during the day, make the chutney earlier in the day or a day ahead, cover and refrigerate, then gently warm it while the chicken grills. I like to keep the rest of the meal simple — Basmati rice and fresh sliced mango. Or maybe just some good naan with cilantro chutney. Prepare the marinade for the chicken. Heat a small heavy-bottom skillet over medium heat. Add the coriander, curry, cumin, and black pepper. Cook for 1-2 minutes, stirring frequently, until the spices release their aroma. Combine the yogurt with the lemon juice and spices in a small mixing bowl. Sprinkle both sides of the chicken breasts evenly with the salt and put them in a large zip-lock bag. Pour in the marinade and squish the contents around until the breasts are thoroughly coated. Marinate for at least 30 minutes. A couple of hours in the fridge would be even better. Prepare the chutney. Heat the olive oil in a medium heavy-bottom skillet over medium heat. Add the shallots and the Serrano chile. Cook for 2 minutes, stirring frequently. Add the ginger and garlic to the skillet. Cook for 1 minute, stirring frequently. Add the tomato, vinegar, sugar, mustard seeds and salt, then bring to a boil. Cover the skillet, reduce the heat to low, and simmer the chutney for 10-15 minutes. Uncover and simmer for about another 5 minutes or until the chutney thickens a bit. Set aside and keep warm. Prep a gas grill by preheating on high with the top down for about 15 minutes. Clean the grill thoroughly then carefully spray the grates lightly with cooking spray. Remove the chicken from the marinade, shaking it to let the excess drip back into the dish. Use tongs to place the chicken breasts on the hottest part of the grill, browning them for 4-6 minutes or so on each side. Keep a close watch so they doesn’t get torched. Move the chicken, skin side down, to the cooler part of grill, with the thicker side facing the hotter part of the grill. If your grill is super hot, you may want to turn off the side burners and put the chicken there. Low and slow is the way to go at this point. Grill for around another 20-25 minutes longer, turning the chicken occasionally until a meat thermometer reads 160 degrees. Pull it off the grill and let it rest for 5 minutes, during which time the temp will rise to 165 degrees. 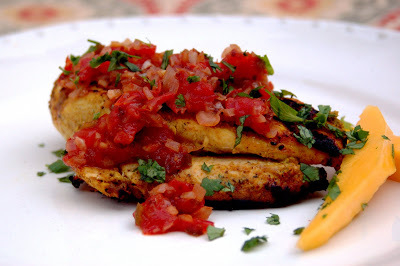 Top the chicken with the tomato chutney and garnish with cilantro.